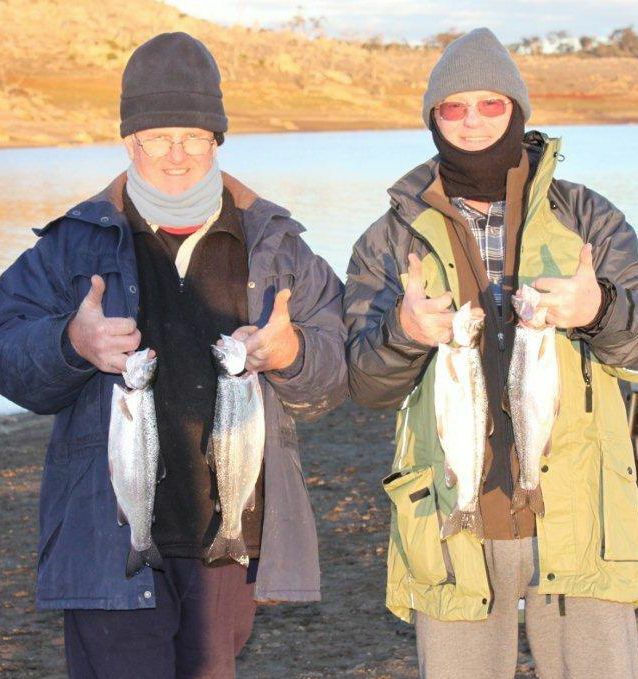 Reports have been a little scarce this week though the baitfishing has been very good in Eucumbene. Hopefully will get some more reports over the next week. Polaroiding conditions have been very good over the past week so now is a good time to be searching for some cruising fish in Jindabyne. Eucumbene:- Eucumbene trolling reports have been good for the few that have give thyem. Deep water fishing with leadcore and downriggrs have worked well on the rainbows. Thought you would like a report from Eucumbene. John Nowak, Alan Smith and Alan Hocking fished over the past few days out of Buckenderra. Attached are some photos'. The weather was kind or should I say kind of COLD but fishable. 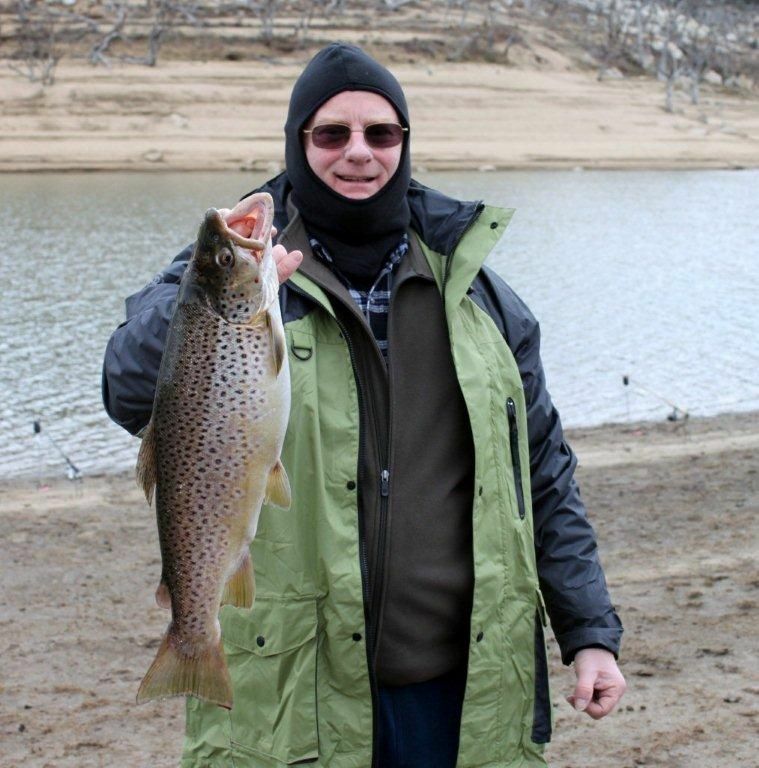 Alan, (John's brother-in-law) managed not only this fine Brown of around 2.5kg but picked up a second one the same day. These were taken from the bank on power bait. John asked Alan if he was having a good time. Alan's response was GREAT, and John said, make the most of it as this will be the last. Over the past 15 months John has been trying for a Brown and only managed Rainbows. We met up with Ken Cain and the one and only Mr Scrubworm. We all fished from the bank for a couple of nights but only picked up a few. Choice of bait was, Chunky Cheese, Lime Twist and Orange Pulp. This report was from Tuesday till Thursday and I left on Friday late morning and as usual the fish came on prior to the change on Saturday. 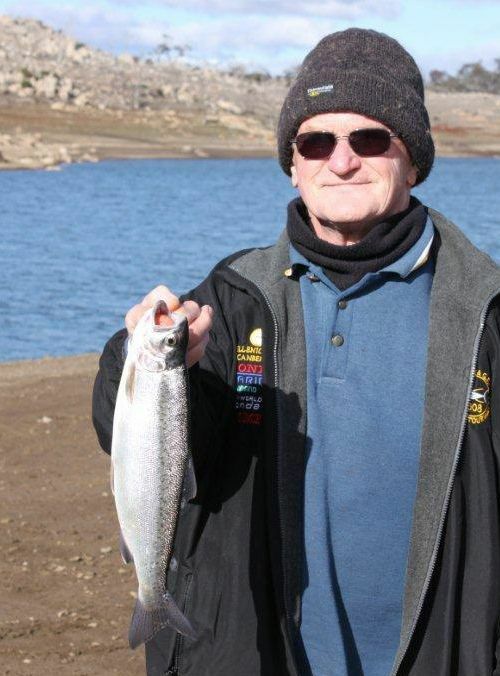 Jindabyne reports have been quiet overall.